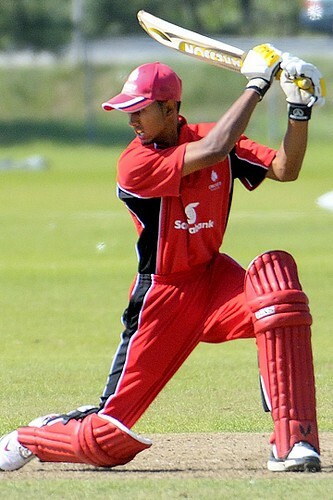 The Ontario Cricket Academy will embark on its second tour to Trinidad and Tobago on March 12-22, 2010. The group which is mainly comprised of Under 17 players will face top level competition on the tour, most notably a match against the Trinidad and Tobago Under 16 XI. Other fixtures include top league opposition such as FCB Clark Road, Alescon Comets and Central Cricket League XI. The Ontario Cricket Academy team will be hoping to improve on last year’s record of three wins and two losses, including a win over the South Trinidad U-16 XI. Coach Derek Perera believes that the OCA youngsters have the potential to beat the T&T opposition, “our team has 8 players who have represented Canada and Ontario at the youth level, and they have been working extremely hard over the last few months in preparation for this trip. If we play to our potential, we can win”. Another highlight of the tour will be a day of coaching at the Queens Park Oval, led by former WICB Development Officer, Kumar Rampat. On the last trip, Rampat, who leads the coaching at QPCC’s Brian Lara Foundation, was so impressed with the Ontario youngsters that he officially stated at the closing ceremony, “As the former WICB Territorial Development Officer for Trinidad and Tobago (2003 – 2007), having seen all the youth teams visiting TT during this period, I can easily say that this is the best prepared youth team coming out of North America that I have witnessed. There are also several youngsters who have displayed skill levels beyond their chronological age”. The Ontario Cricket Academy wishes to thank all sponsors and organizers who have made the trip possible, with a special mention to Caribbean Airlines for their continued support of the academy’s youth cricket program. As someone that was born and raised in Ontario, I really wish we had an academy like this when I was younger! I am very impressed with the level of coaching Ontario Cricket Academy players are receiving. Derek Perera and Sunil Khandor have established an academy that provides young players with an ideal place to learn the sport and gain invaluable experience. Visit the Ontario Cricket Academy Homepage for more information on their programs. Here’s a news article from Trinidad on the teams performance last year. The one thing that stood out the most for me, was that last years team featured only 4 players that were not born in Canada. The rest were 1st generation Canadians. We’re beginning to see more Canadian born players starting to pick up the game and that is very welcome news. Cricket Canada in association with Cricket British Columbia is issuing a call for tender for the installation of turf wicket facilities at the Abbotsford Recreation Ground (ARG) in Abbotsford, British Columbia. visit Cricket Canada for more information. After failing to qualify for the ICC T20 World Cup last week in Dubai, Cricket Canada issued this statement regarding the teams performance. ‘Last Thursday our senior men’s team lost to UAE to conclude the recent T20 Cricket World Cup qualification tournament without a win. Though we were not alone in not moving on in the tournament, Cricket Canada takes this failure to move on very seriously. 2009 was a banner year for Cricket Canada, there were many firsts and after a few sub-par years, performances had turned around with the men’s team while success continued in all our other programs. This included a return to the 50 over world cups for the men and the u19 team. Obviously we felt that this would continue into 2010 with both our senior men’s team’s and u19 teams engaged in high profile tournaments. Like our fans and supporters both the adminstration and players expected more out of the first two months of the year and are deeply frustrated at the results. We are in a transition phase as we try to refresh our team with future stars while at the same time retain our commitment to putting a winning product on the field. This is not an easy task and we are paying the price for decades of stagnation in development programs in this country. With this in mind, we are instituting a full review of all of our cricket programs. The review will commence later this month and will be spearheaded by person’s independant of Cricket Canada. We have asked that all of our personnel cooperate with us during this time and are confident we will emerge stronger and better prepared for the challenges that await us. The Ontario Cricket Association will be partnering with the ICC Global Cricket Academy in Dubai to provide a 1 week training camp to be held in the greater Toronto area for the top players in Ontario. OCA President Mike Kendall was notably excited at the news that former test players Mudassar Nazar (Pakistan) and Rodney Marsh (Australia) would be conducting the camp and they will also provide opportunities for 6 OCA coaches to learn from the experience as well. ‘It gives me a great pleasure to inform you that OCA, in partnership with ICC Global Cricket Academy Dubai, is conducting a Cricket Training Camp in the GTA area, for our best propects in Ontario. The camp will be run from 30th March to 05 April, 2010 and will primarily focus on our younger players. We are very fortunate to be able to benefit from the vast experience and knowledge of the Academy Director Mr. Rodney Marsh and Head Coach Mr. Mudassar Nazar, who will be personally conducting the training with assistance from 6 OCA coaches. This is one of a kind camp ever conducted in any of the ICC Associate countries and we are very lucky and proud to be hosting it here in Canada. The OCA had already sent out correspondence to it’s member leagues to put together a list from each league of ‘elite level’ players to be short listed for Ontario’s inter provincial matches this summer. The goal is that this training camp will help find talented cricketers and give them a platform for selection into the Canadian side. Kendall also added that while this was an Ontario Cricket Association initiative, the OCA will be sending invitations to all Cricket Canada member provinces. OCA will be looking for sponsors for this event to help cover some of the costs. I caught up with Rizwan Cheema before he left for Sri Lanka to take part in the T20 4 Nation Cup before team Canada heads to the ICC T20 World Cup Qualifying tournament in Dubai next month. From the moment I started watching Cricket, my favourite player has always been Wasim Akram. I loved the way he ran in and made the ball move in 3 different directions before it reached the batsman. And I always got excited when he came into bat, in hopes that he would start launching sixes over the mid-wicket boundary. Then Shahid Afridi came along. It’s hard not to catch ‘Boom-Boom’ fever anytime he strolls in to bat. After leading Pakistan to the T20 world cup finals victory with outstanding performances in the semi’s and final, he’s shown the world that he might just be able to reign in his natural aggressiveness and become a more mature player. But, now I have a new favourite player. His name is Rizwan Cheema and although the rest of the world might not know him (…yet), he is an entertainer just like the above mentioned Afridi and Akram. His raw talent and ability to smash the ball all over the field have earned him the praise and respect of the international players he has played against. He also bowls some handy medium pace and has a habit of picking up timely wickets. Canada Kicks Off U-19 World Cup In Style With A Big Win! Canada kicked off the U-19 World Cup with a bang today with a tense victory over Zimbabwe. Canada won the toss and elected to bat and held off the a tough Zimbabwe team by 10 runs to get secure their first ever victory in the tournament. Canada started off well within the first 10 overs with Ruvindu Gunasekara and Hiral Patel getting Canada off to a steady start. Ruvindu was the first batsman to depart after making 20, while Hiral made 29. In the next 10 overs Canada lost 3 quick wickets before Usman Limbada took charge with a superb 90 runs off only 114 balls. A knock which included 6 fours and 1 six which helped the boys reach a defendable target of 201-7 after batting their alotted 50 overs. Usman shared an important 57 run partnership with Darius D’Souza (20 from 34 balls). Although it wasn’t a huge target it was certainly enough to put up a good fight and they held their nerve in the last few overs. Zimbabwe’s chase got off to a rocky start because of some great bowling from Zain Mahmood and Arsalan Qadir. Zain picked up 3 wickets for 31 runs to lead the bowling attack. Zimbabwe was 23-3 before Wicket keeper Dean Mashawidza and Andrew Lindsay steadied the chase for Zimbabwe with 75 and 40 runs respectively. Parth Desai got the crucial breakthrough by trapping Mashawidza in front for a big LBW. Zimbabwe fell short by 10 runs and were all out in the 50th over. It’s the first ever victory for Canada at the U-19 World Cup and hopefully a good sign for things to come. But, while it is a big victory, it is only one game. The team must treat this like any another game and start preparing for the hosts New Zealand tomorrow. There will be plenty of time to savour this victory after the tournament is over… This game is definitely history. Check out the full scorecard here. For more coverage head to the home of Cricket Canada. Become a Fan on Facebook or follow the team on Twitter.